"If you can assist a young Pacific person to live to their full potential, that has a whole ripple effect in the community." Josiah is a young Samoan changemaker set on inspiring youth advocacy in his community. He sits on a number of boards, and is advocating for Pasifika youth and ensuring young Pasifika people’s ideas and perspectives are considered by decision makers. Josiah is the recipient of the 2016 Prime Minister’s Pacific Youth Award for Leadership and Inspiration. At 18, he became the Chair n of the Pacific Youth Leadership And Transformation Council (PYLAT) which he helped establish. He helped develop the University of Canterbury’s Pacific strategy, mentors, is part of the Youth Voice Canterbury Network and co-developed the iSpeak forums & the Christchurch Pasifika STEM (Science Technology, Engineering & Maths) Fono. Josiah grew up in Dunedin, and moved to Christchurch to attend the University of Canterbury. When he was young, he didn't get much of a chance to talk about what it meant to be Samoan or of a Pacific culture. His mum was born in Australia, and his dad is Samoan. Getting involved in the Pacific community in Christchurch helped explain things he'd always done, but not known why. 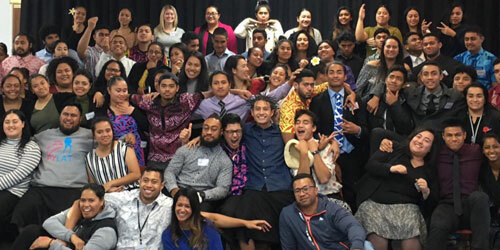 A lot of young Pasifika people have this identity crisis – having an ancestral homeland that we may never have been to can be quite isolating. It feels like you're missing something. The more he learned about his Pacific culture, the more he wanted to help be a champion for other young Pasifika people to connect, learn, celebrate their culture, and participate in democracy. He helped to set up and is now the Chair of the Pacific Youth Leadership and Transformation (PYLAT) Council Trust.